The “finest” is that so, we’ll see. These ‘premium’ mortising chisels are not cheap, the 1/4” chisel pictured below is $33 and the price goes up from there. I shopped chisels all over the interweb so a word of advice, dig until you find the country of origin because the vast majority including some previously made in Europe chisels are now made in China. I went back to the Grizzly site after striking out elsewhere and found these Star-M brand premium chisels made in Japan. Hard to argue Japan’s quality these days so I ordered up 6 in various sizes. 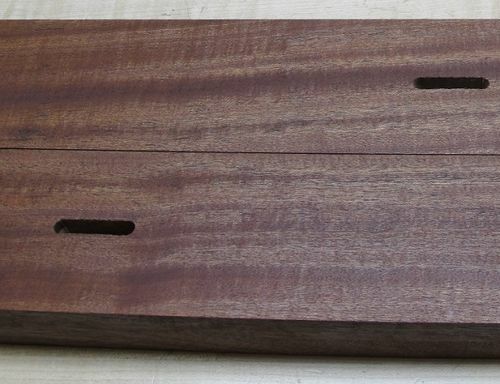 Well I don’t know if the chisels are the ‘finest’ but they chopped through this Sapele like it was butter, quite smooth. Sapele isn’t the hardest wood by any means but those fences are over 1-1/2” thick. The quality of the cut seems decent, I felt no need to clean up the cuts further as its just a fence for the RAS. Okay the mortiser. I had not used the machine yet so I took a few minutes to measure/adjust it. The fence swivels so I locked the fence on ‘0’ and tested with a dial indicator mounted to the column while I cranked the table left and right, it measured -.004 left 0 center -.004 right so there’s a crown in the middle but .004 is almost nothing AND remember the clamp to clamp down the wood is in the middle pushing against that crown, my guess is it would deflect that crown back flat if not further so I was pretty happy with this measurement. Next I measured the table with the dial indictor while moving it forward and back, it measured ‘needle flutter’ which is to say +- at most .001 the indicator needle just fluttered as it ran across the surface of the table. Okay I’m impressed with that. There were a few more things I could have measured but as this was just a fence for the RAS I got on with cutting these slots. FACE PALM - See the block of wood holding up the mortiser head, see the FAIL counter balance cylinder removed, its supposed to counter balance the weight of the head, without it the head just crashes into the table. I knew that thing was going to be trouble during assembly. At times it would reverse operation like a valve tripped the opposite direction internally and it would force the head down instead of up and you would have to force the head back up with the arm and wait for it to correct itself. This was most problematic when you lowered the head to its lowest position e.g. compressed the cylinder fully. Well half way through the third mortise it reverses operation and got stuck. I could lift the head with the mortiser arm by force almost lifting the machine off the ground and the air pressure would force the head back down to the bottom. Arrgh! I got the wrenches out and removed that stupid thing. I could contact Shop Fox for a replacement OR I could counter balance the head properly with a weight. I will opt for the latter because with the air cylinder its not easy to tell whether you are forcing the chisel into the wood too fast because you are pushing against the air cylinder. A counter weight of the proper size would give smooth balanced operation up or down with much better feel while feeding into the material. Finally here’s a shot of the fences installed, this RAS is coming together. I just need to paint the blade guard, install the dust collector and wire it up. Nice review on both items, well written. I have a question though: how did you manage to get the chisel to make round mortise ends on the slots? Tricky! PS: I also have a Shop Fox mortiser, table top version, and I agree the gas spring is a pain, my machine has three settings for different stock thicknesses. Any way, how or where do you plan to attach a counter weight? If your attempt works, I’d like to try this. 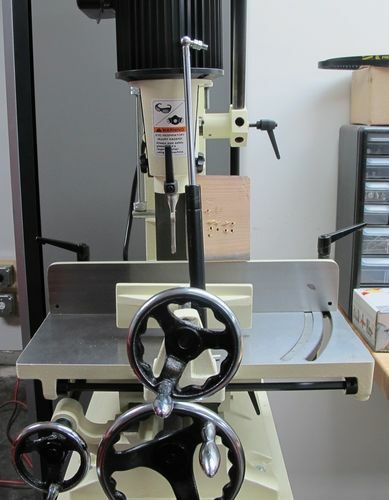 Oldtool I used my Jedi powers…no I predrilled both ends of the slot on the drill press. ;-) TBD how I fashion the counter weight. The back of the column is already drilled and tapped for a cover plate so I could fashion an L arm with a couple pulleys and bolt it on there. If I had a permanent location of this I’d just attach the two pulleys to ceiling joists, I counter weighted one of those big RongFu mill drill heads that way once. I used sand bags for weights, they sold them cheap for weighting down the rear of your truck back east for driving in the snow. That’s probably more weight than I’ll need for this mortiser though. Actually, with that rack and pinion on the column, I’ve found the machine fairly safe from dropping. If you counter weight idea works out well, let me know. 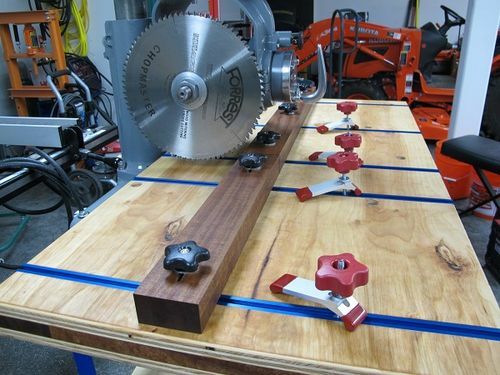 How do you align your radial arm saw fence to the blade for true 90 degree cuts? There are several ways to do that but I probably wont’ go crazy, just adjust it close with a square then use the micro-adjusting set screws on the saw to dial it in perfect e.g. make a test cut, check with a precision square, repeated until its dead on. I will likely drill and pin those fences at 90 degrees with steel dowels once its dialed in in case I need to remove them or replace them at some point. I realize this is an old post, but want to mention that my Delta benchtop mortiser has never had any problem with the pneumatic cylinder. Works perfectly.